This year’s Pony Wagon Days festival kicks off on Thursday. The parade route for this year will start at the intersection of High and Main streets before heading east down Main Street and ending in front of the old junior high school site, 370 E. Main St.
ST. PARIS – The annual St. Paris Pony Wagon Days festival will start Thursday. This year’s festivities will again be held in front of the old junior high school building, 370 E. Main St.
Amy Weinert, Pony Wagon Days Committee secretary, said the committee received positive feedback last year after moving the festivities from the downtown area to the old junior high school site. Opening ceremonies will begin at 5:45 p.m. and will include a prayer, color guard, singing of the national anthem by the Graham Varsity Choir and the crowning of the Pony Wagon queen, princess, little miss and little mister. Following the opening ceremonies, the parade will start at the intersection of High Street and Main Street. 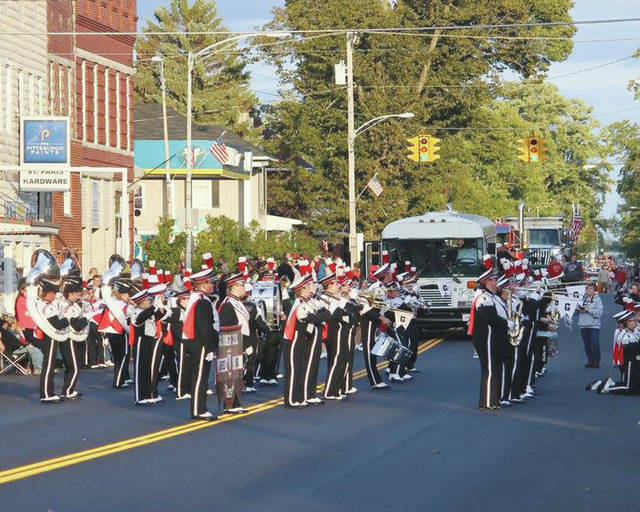 While the previous parade route had participants line up at the old junior high site and end near the park, Weinert said this year’s parade route will start at the intersection of High Street and Main Street, proceed east down Main Street and end in front of the old junior high site. Once the parade concludes, the annual basket auction will take place with proceeds benefiting the Pony Wagon Days Organization. Rides will also be open following the parade. Friday’s entertainment will include the Off the Record Video DJ Service starting at 6 p.m. under the entertainment tent. On Saturday, the annual car show will take place downtown on Springfield Street from 9 a.m. to 2 p.m.
At 5 p.m. Larry Lyons will perform before Grampy Bone performs at 7 p.m. Both performances will be held under the entertainment tent. The festival is free to attend and free parking is available on the street. Parking for near the old junior high site will be available for disabled or elderly citizens. Food and crafts will start at 5:30 p.m. Thursday, 5 p.m. Friday and 2 p.m. on Saturday. Weinert said anyone who would like to volunteer during the festival can contact the committee at ponywagondays@yahoo.com or sending a private message on the Pony Wagon Days Facebook page.